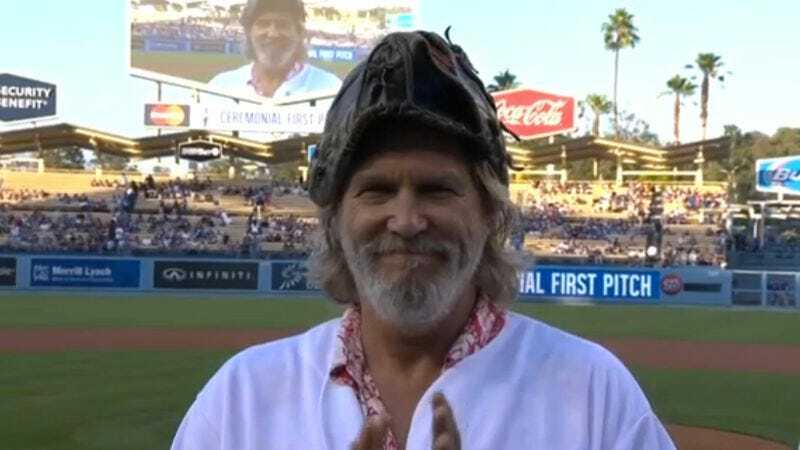 Last Friday, actor Jeff Bridges was given the honor of throwing out the ceremonial first pitch at a Los Angeles Dodgers game, an event for which he showed the necessary deference by wearing a baseball glove on his head. Not to be outdone by the recent first pitches of 50 Cent, Jack White, and Robocop, Bridges opted to keep things playful and invoke The Dude, his beloved character from the Coen Brothers 1998 film The Big Lebowski. Even though Bridges was there to promote the upcoming film adaptation of The Giver, he opted to forgo any solemnity, and after a rather animated windup, he came barreling off the mound and bowled the baseball right into the batter’s box. Jokiness aside, Bridges’ Lebowskian effort was still less of a shambles than 50 Cent’s, but maybe that just means that Bridges masturbates with less frequency and/or vigor than 50.